This articulated ring is sterling silver with a bone motif. 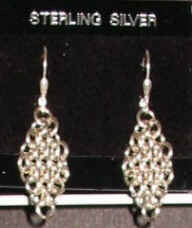 The three rings are adjustable, so they will fit from a size 8 - 12 with no problem. I was only able to get one. One this one is gone, it's gone. 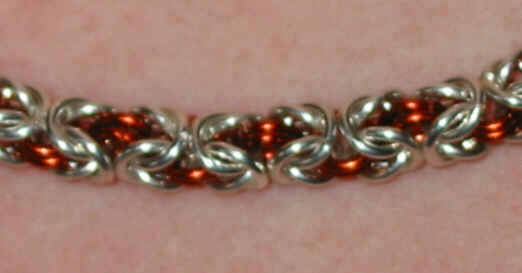 Sterling Silver King Chain accented with enameled red copper. To see the close-up of the pattern click on the top picture at left. The pattern is really quite striking. Both the 18" necklace and 8" bracelet feature a sterling silver lobster clasp and can be combined to really make the neighbours jealous. 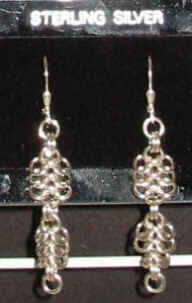 These pieces are featured in theChain Mail Jewelry book. 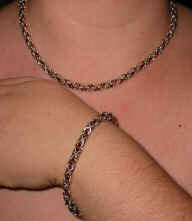 Titanium and rubber bracelet knitted with 3 rows of rubber and 2 rows of titanium. Rings are all 5/16" X 1/16". If you have metal allergies, this is a cool accessory that won't cause you to break out and won't break the bank. Available in a variety of colours. 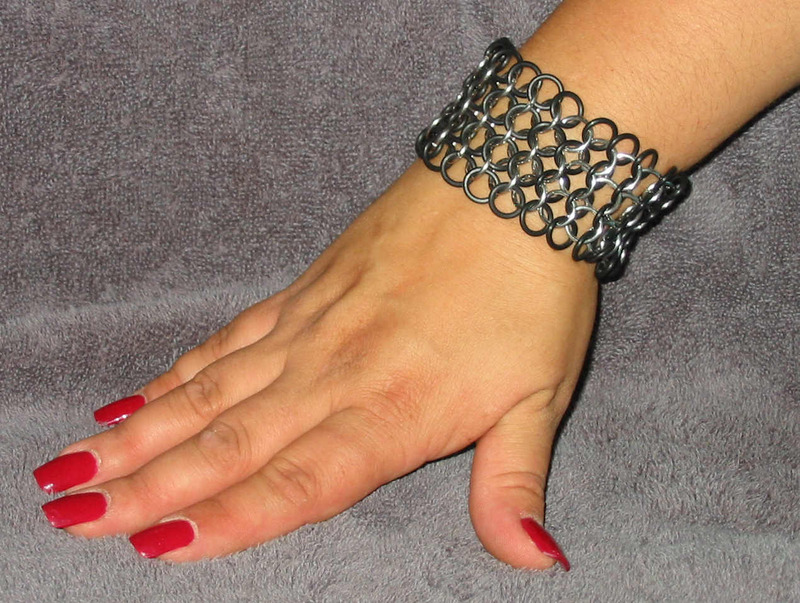 This item is featured inChain Mail Jewelry. 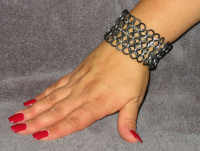 Titanium and rubber bracelet knitted with 4 rows of rubber and 3 rows of titanium. Rings are all 5/16" X 1/16". If you have metal allergies, this is a cool accessory that won't cause you to break out and won't break the bank. Available in a variety of colours. The following are some of the knits you can choose from in pretty much any material. 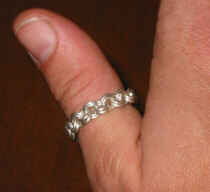 Some knits are not possible in certain rings because the ratio of wire diameter to ring diameter makes for an impossibly tight weave. If you want to knit it yourself, these knits are described in Chain Mail Basics 3rd Edition. Here's an extreme close-up of sterling silver 18AWG 1/8" diameter rings. The knit is double-knit cable chain. This is Knit-3-Drop-1, done in 14K gold-filled 20 AWG 1/8" dia. rings. It makes a gorgeous bracelet that's reminiscent of flowers. 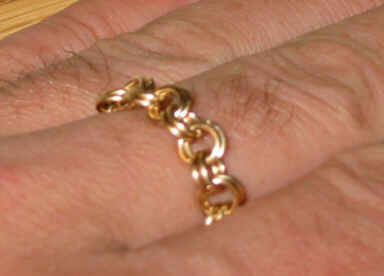 Here we have a French Rope knit, again in the 1/8" gold-filled rings. Note that this knit is not available in 18AWG wire & 1/8" rings, because the knit is just too tight. It will work, however, in 18AWG 3/32"rings. This knit is Foxtail. As you can see it's awfully tight in the 20AWG 1/8" ring, but it's still flexible. This knit is known as King Chain, King's Braid, or Byzantine. It's deceptively easy to knit. Despite its look, it's a close cousin to Foxtail. 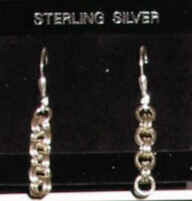 Sterling silver double-knit cable chain, 1/8" dia. loops. Unlike a normal hard ring, these move and give with you. They feel like a living ring. If you can't wear rings at work because of a crushing or catching hazard you can safely wear these. The joints in each loop are butted instead of soldered; if a machine grabbs your finger by the ring, the ring would break loose instead of the finger. 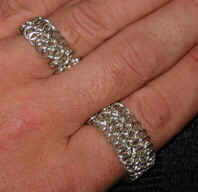 Sterling silver 3 row and 4 row 4-in-1 knit living rings. 1/8" dia. loop, 1 mm wire. 14K Yellow gold-filled double-knit cable chain, 1/8" dia. loops. Unlike a normal hard ring, these move and give with you. They feel like a living ring. If you can't wear rings at work because of a crushing or catching hazard, you can wear these. The joints in each loop are butted instead of soldered; if a machine grabs your finger by the ring, the ring would break loose, instead of the finger. 14K Yellow gold-filled 3 row and 4 row 4-in-1 knit living rings. 1/8" dia. loop, 0.8 mm wire. No headpieces are currently in stock. Please check out the Gallery page for ideas and contact me to discuss your dream veil or headpiece. 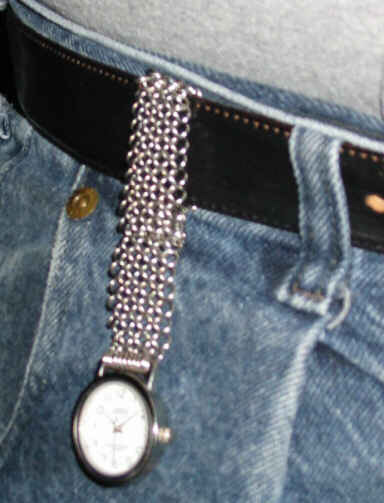 Have a nice watch with a bad band? Want it converted? E-mail me and I'll quote you a price for exactly what you want.